Thank you to everyone who came to see my talk at Graphisoft BIM 2017 North America User Conference. As promised here are links to the files I used in my presentation (…and quite a few more). The best way to understand the details of talk is to dig into the PLA files and see how the bits are structured. I look forward to hearing your comments and keeping in touch. Here’s a summary for a seminar I’ve submitted, which I hope to present at the Graphisoft BIM 2017 North America User Conference and the AIA 2017 National Convention. Please let me know your thoughts and follow my blog as the topic develops. By understanding the basic principles of effective building enclosures and applying BIM techniques smaller firms can improve analysis during design development and more clearly communicate enclosure requirements in their construction documents, thereby improving quality assurance and diminishing their professional risk. Building enclosure failures are common. Moisture problems are more likely to land you in court than structural issues. Mold is gold. What can you do? Understand the principles of effective enclosure design. Model it. Educate the team. This presentation will review the basic principles of building science in relation to thermal and moisture control. It will then explain how to use tools within ARCHICAD to model and illustrate thermal characteristics, drainage planes, air barriers, and vapor retarders within building enclosures. Specific ARCHICAD concepts include Building Materials, Priority Based Connections, Composites, Custom Profiles, Graphical Overrides, Selection Criteria, and Energy Evaluation. Understand the basic principles of effective building enclosures in relation to thermal and moisture control. Establish priorities for the intersections of materials within the building enclosure. Identify and model the typical assemblies and intersections within the building enclosure. Demonstrate proper construction techniques in 3D using whole building models, assembly sequences, and cutaway details. In ArchiCAD layers are good for no more than three things: visibility control, editing convenience, and improved rendering speed. Remember Revit gets by with none at all. There are better ways to categorize data. Among ArchiCAD data fields the Element ID offers the broadest functionality to identify and group elements for Interactive Schedules, Lists, Find and Select Criteria Sets, and the IFC Manager. 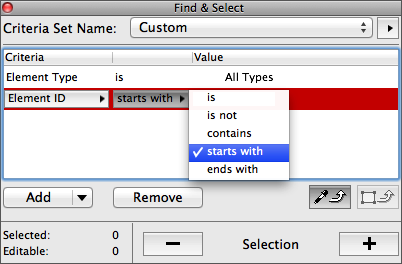 You can assign an Element ID to any Construction Tool, Object, Zone, Fill, or Grid Element using up to 15 characters. You can edit it in the Tags and Categories panel, an Interactive Schedule, or the Element ID Manager. You can even display it in plan with element Label Settings. Scheme Settings are used to establish selection criteria for Interactive Schedules. The Element ID field offers nine conditional functions: greater than, less than, greater than or equal to, less than or equal to, starts with, ends with, contains, is, and is not. 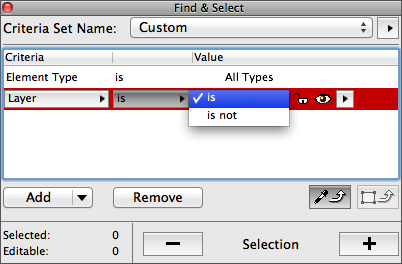 Other non-numeric fields, including Layer, offer two: is or is not. 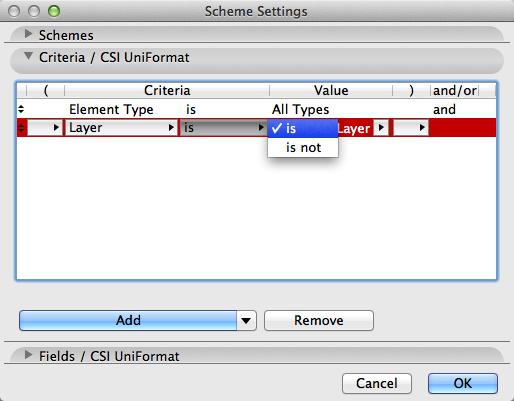 Of course you’re free to incorporate layers into the Scheme Settings, but the Element ID obviously packs more punch. From here it’s just a matter of nomenclature. Consider a twist on a familiar tool. Using Find and Select you can create Criteria Sets to choose elements to display in the 3D Window and hence in a 3D Document. The filtering logic is similar to Interactive Schedules. So regardless of your layer strategy, you can isolate a particular system or set of components in a 3D Document. You can even use 3D Documents to create pseudo-plan views, elevations, and sections. Apply the appropriate Criteria Set. Select Show Selection/Marquee in the 3D Window. *Or if you’re not worried about preserving annotations from an earlier version, just go straight to the 3D Window and apply the Criteria Set to make a new 3D Document. 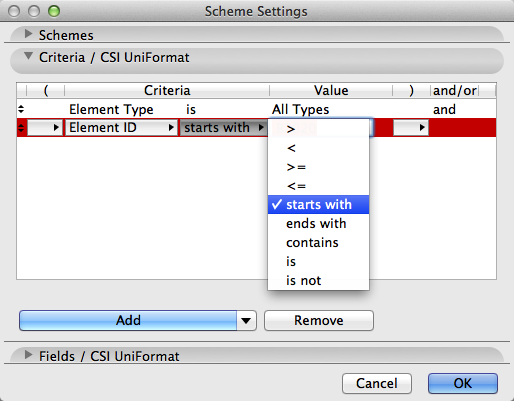 Whether simple or complex, you should be systematic about setting Element ID’s. You’ll find the conditional functions starts with, contains, and ends with to be especially helpful. In simple situations, identify elements with prefixes like “W” for window and a numeral to indicate a unique instance or shared type, such as “W-07”. In sophisticated situations, adopt a standard like UniFormat. A fixed exterior window might be denoted as “B2020.20-07”, where “07” again refers to a particular instance or type. In a hierarchical system like UniFormat, the criterion “Element ID starts with B20” would select that window and all other exterior vertical enclosure elements. 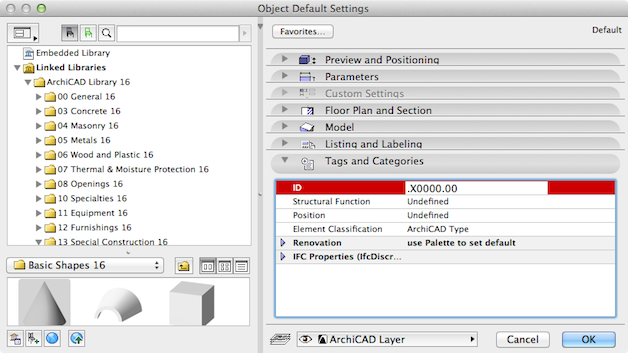 If you’re into exchanging files, the IFC Element Name is the ArchiCAD Element ID, and it’s set by the ArchiCAD user. IFC also uses two unique identifiers set by the system: the GlobalId (the Globally Unique Identifier in the IFC model) and the Tag (the ArchiCAD GUID, which differs from the IFC GlobalId). Manage drawings with layers and data with Element ID’s, so changes to one shouldn’t screw up the other. Use no more layers than the drawings require. Geometry first. Data later. Connections: Follow additional commentary at LinkedIn/ArchiCAD.